It’s customary when a major country music artist passes away that the country music community in Nashville comes together in tribute to the star, with performers from today and yesterday taking the stage to honor the fallen great. This is what happened for George Jones, “Little” Jimmy Dickens, and many more of the major country stars in the weeks after they passed. But this never happened for Merle Haggard, who passed away on April 6th, 2016. Perhaps you can blame the fact that Merle was not a Nashville resident, and found his final resting place at his ranch just outside of Redding in Northern California instead of the customary Nashville cemetery. Or perhaps it was because Merle was so critical of the country music industry in his final years. Either way, a tribute is finally planned for The Hag, and it promises to be a star-studded event. 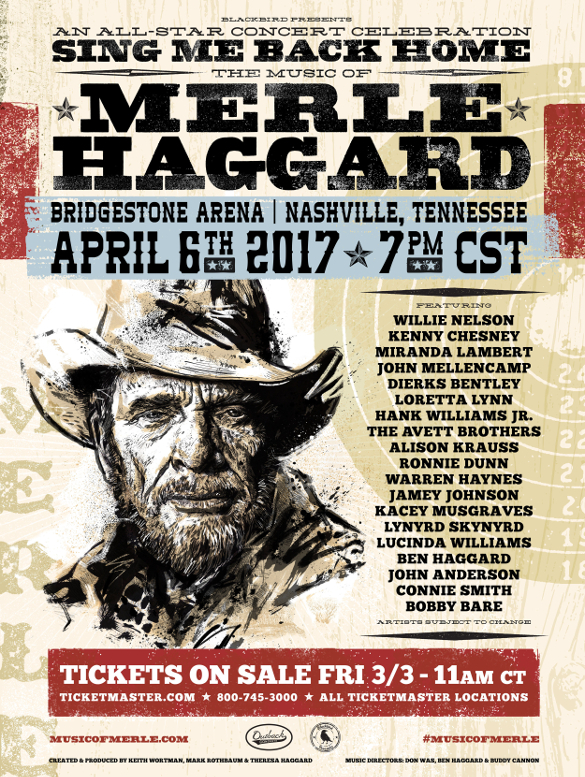 Sing Me Back Home: The Music of Merle Haggard will take place at Nashville’s Bridgestone Arena on Thursday, April 6th to honor what would have been Merle Haggard’s 80th birthday, and to mark the one year anniversary of his passing. Not just a memorial concert, the entire event is being produced to be disseminated via multi-platform media in the future. Performers at the event include Willie Nelson, Miranda Lambert, John Mellencamp, Dierks Bentley, Loretta Lynn, Hank Williams Jr., The Avett Brothers, Alison Krauss, Ronnie Dunn, Warren Haynes, Jamey Johnson, Kacey Musgraves, Lynyrd Skynyrd, Lucinda Williams, Ben Haggard, John Anderson, Kenny Chesney, Connie Smith, Bobby Bare, and MORE TO BE NAMED LATER. Don Was, Buddy Cannon (hence, why Chesney is involved), and Merle’s son Ben Haggard will be the the musical directors for the event and lead a star-studded house band behind the performers. The entire event is being produced by Keith Wortman, Mark Rothbaum and Merle’s widow, Theresa Haggard. A portion of the proceeds will benefit the T.J. Martell Foundation. “I am so very thankful for this tribute to my husband, Merle Haggard. Please come join me and my family at this fantastic show that Merle would be so proud of,” says Theresa Haggard. Invariably more names will be added to the lineup, so don’t pout too hard if you don’t see the name of someone you think should be included not on the list yet. Additional details will also be disclosed as the concert nears. Tickets will be put on sale Friday, March 3, 2017 at 11 A.M. Central online via Ticketmaster, and immediately afterwards in massive wads for four-times face value on StubHub. I think Charley Pride should be asked to honor Merle. He and hag go back a ways. Charley’s a living legend that should get more recognition. Hag saved him once by offering the Strangers. I think that would be a great honor, by a great friend. George Straight, Alan Jackson, Marty Steward should also be in that circle. All the old time grates. Charley, Willie, and Loretta, are up in age and shared the stage back in the day. Those three should be under to Ben Haggard, Marty and Noel on the list. Ben Haggard and Lukas Nelson should perform Poncho and Lefty. Please ask your self who would Merle want to shine some love on. The way these tributes concerts work is they release an initial lineup of names, and then many get added on over time. They do this to help promote the event. “So and so just added!” So I wouldn’t get too worried about who isn’t included just yet. They just did something similar for Randy Travis a few weeks ago, and there were a good dozen names added between the initial lineup and the concert. Marty Stuart’s Way Out West tour starts that night in Indianapolis. That’s good and bad. I know Marty would love to be there if he could. I believe he’s promoting an album Hag would be proud of though. Plus Connie is there to represent. I think Leona Williams and Ron Williams should be included,Leona wrote a lot of Merles songs they have songs they sang together,I think she would be a great tribute to Merle. Currently spinning “Okie From Muskogee – Live” on vinyl as I saw this pop up. Seems appropriate. It seems to me that, given his ties to that community and the part it played in his music, Bakersfield would be a more fitting and deserving venue for such a tribute. Bakersfield should have a tribute to, but to wrangle talent, Nashville is the best venue. And Bakersfield doesn’t have a venue even half the size of the Bridgestone Arena. Please, oh please don’t have any current “bro country” guys singing Merle. Kris Kristofersen would be an obvious add, along with Sturgill. For a Bridgestone size arena near Bakersfield your closest bet is probably LA which is about 100 miles away. Bakersfield has a 10k arena though. These tributes of late have all been put on by the same folks, and Don Was has basically directed them all. From Gregg Allman to Skynyrd to Levon Helm and many others, with this one being the latest. They’re always well done and they always have a great lineup. And they always seem to include Warren Haynes, so that’s reason enough for me to tune in! They need younger artists…with some connection to Merle…or who are relevant today. Clint Black’s an obvious one. Toby Keith’s and Tim McGraw should both be there. Eric Church, definitely–if he’s available that night. Also Springsteen–He’d probably do it. Oh, and Dwight, of course. I suppose this will make television somewhere as I am disabled and can’t make it? It is definitely being produced for distribution. If and when it is made available I will try to let everyone know. Where’s Sturgill’s invite?! He’s right there in Nashville. He will be added late i’m sure. Eric Church would be a great add. Everybody’s got their wishlist here, however I think the current lineup is fantastic. Hank, Loretta, Skynyrd, Alison, Willie, Bobby, Miranda, Jamey.Cmon people, instead of wishing …Enjoy who they have. I’m insanely jealous cause I don’t think I can go. I salute the promotors wholeheartedly.. I could do without the Avetts though, seen em live and just don’t dig em…but hey its a killer lineup! Just listen to the tribute album he did for, and together with Merle back in 1981, “Mr Hag Told My Story”. Johnny sings his favorite Merle songs, talking in-between the songs, making them personal. You understand how much Merle meant for Johnny listening to this album. It’s not available on Spotify but on Youtube, enjoyed best on Vinyl though. This is being produced by Blackbird–they also did the Life and Songs of Emmylou Harris last year. Will this concert be performed anywhere else in the future? Would love to see it, but can’t make the date. They are recording the concert for distribution through media. As soon as they have specifics on when and where it will be broadcast or put up for sale, I’m sure they will be alerting all of us. 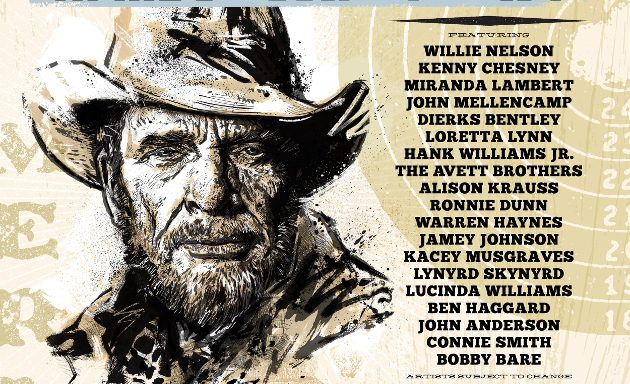 I agree that Vince Gill & Marty & Noel Haggard should be there. Vince’s Tribute Album to Merle & Buck Owens is great! Wish I could be there, but will definitely buy it when it comes out! What about Leona Williams , I think she was an important part of his life and career!! !They had lots of hits together!! I was fortunate enough to be there. It was awesome. A tribute well done. A big thanks to all of those who put it together and all of the entertainers. God Bless and keep up the good work.